Two of my co-workers (and friends) invited me to join them for lunch today in the building across the street. They were going to grab lunch and eat in the cafeteria type area of the building. Having already bought lunch out two days this week, I really wasn’t feeling another lunch out, but I wanted to join them. I decided a fully-portable, no heating necessary lunch was my solution. And so I present to you, my grammar school throwback lunch. 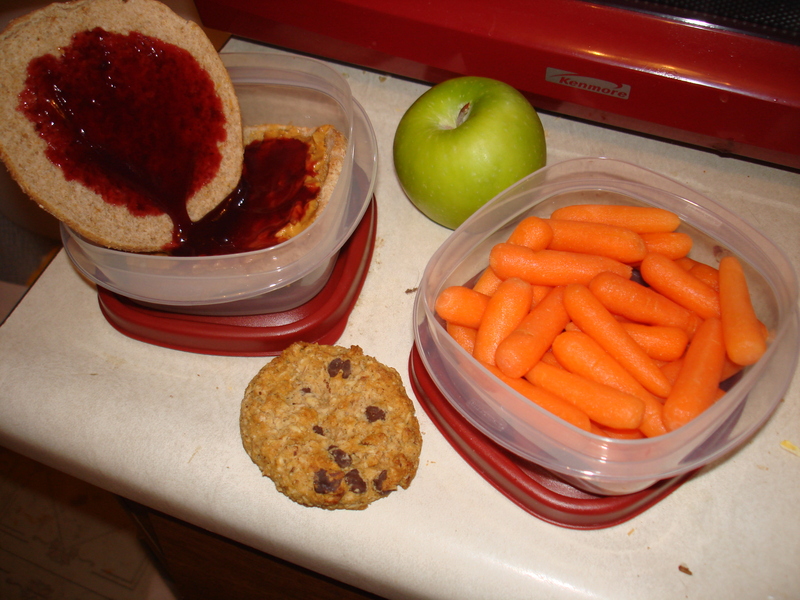 I’ve got a PB&J sandwich (though the sandwich actually has cranberry apple butter not technically jelly), baby carrots, an apple, and a Kashi cookie. Pretty balanced lunch over all, I’ve got my fruit, veggie, whole grains, and some protein. Plus, hello? Cookie! The funny thing about my grammar school throwback lunch is when I was actually in grammar school, I wouldn’t touch a peanut butter and jelly sandwich with a 10-foot pole! I hated PB&J. I ate cheese on bread pretty much every day for 10 years. 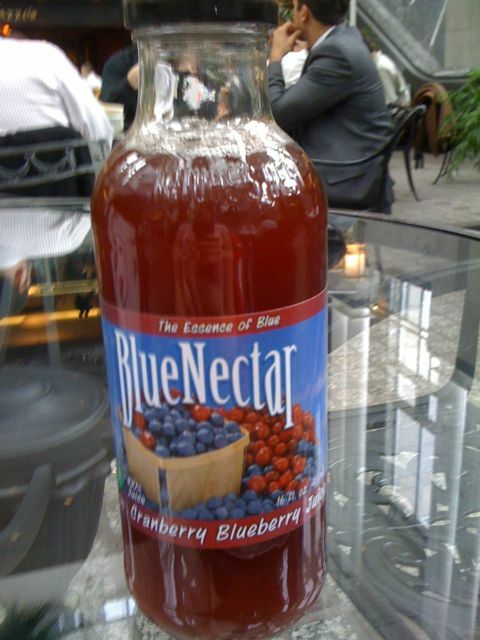 Along with my lunch I had some “BlueNectar” blueberry cranberry juice. Usually I just drink water with my lunch, but since I don’t have a water bottle at work, I needed a portable beverage. It just so happened that one of the agencies we work with sent us a gift basket containing 3 of these babies. The juice itself wasn’t bad. It a pretty simple ingredients list: water, juice concentrates (blueberry, cranberry, apple, and white grape), and natural coloring and flavoring (whatever that actually is.) I liked that the juice actually tasted like fruit rather than sugar water, but it could have used a bit of sweetness since blueberrie and cranberries are both on the tart side of fruits. I didn’t actually eat the apple i brought. I took the picture at home before I packed my lunch up. When it came time to actually eat, I was full after the sandwich, carrots, and cookie. I’ll eat the apple as an afternoon snack if I’m hungry later. I LOOOVE PB&J..it’s a good portable sandwich for sure. Cranberry apple butter sounds amazing also lol Good for you for bringing lunch!